Tom and Jane Mullinax on their wedding night 50 years ago on December 15, 1961. Thomas Brown and Jane Spurlock Mullinax celebrated their 50th wedding anniversary at Auburn Baptist Church in Auburntown on December 11, 2011. Over 120 friends and family members joined them during this special reception. 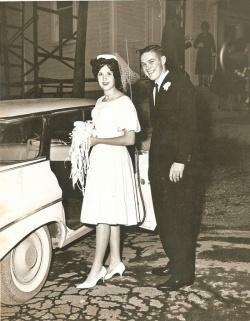 Tom and Jane were high school sweet hearts and married December 15, 1961. They continue to make their home in Auburntown where their love of family and each other remains strong.